White Crane Kung Fu is a rare Chinese martial art which combines foot techniques, hand techniques, chin na (seizing and controlling) and weapons training. This program is offered in our Poughkeepsie school (main headquarters are located in Montreal, Quebec). White Crane Kung Fu is a complete self-defense system that uses hands, feet, knees, elbows, shoulders and hips in its arsenal of striking techniques. The style is renowned, however, for its rapid hand techniques, its strikes executed in conjunction with grabs and its devastatingly effective pressure point attacks. This rare art is particularily effective as it is an ancient family kung system that has remained true to it’s original purpose. White Crane Kung Fu combines defense and attack and uses both soft and hard power. It also emphasizes firm yet evasive footwork. It is a direct, linear and deceptive martial art. This particular system is called Fei He or Flying Crane. Flying Crane makes use of both high and low kicks yet has a marked preference for rapid hand techniques. It stresses empty-hand as well as weapons training, two-person sets, self-defense drills and free-sparring. The style's fierce pressure point attacks combined with rapid footwork and a no-nonsense approach make it a particularly effective, complete, and beautiful martial art. Since many traditional family systems have remained largely unaffected by trends and fashions in the martial arts, students are selectively chosen and the arts remains unaltered. It should be emphasized however, that learning such system’s is more than simply learning how to fight. Rather, apprenticeship can become a means to develop amazing physical skills and internal power, greater self-confidence, a sense of camaraderie and to gain insight into a very ancient culture. In the end, it is ultimately about developing a kind and forgiving heart. This program is geared to individuals interested in learning an effective and complete traditional kung fu system. Although White Crane is definitely a physical system, it has so many techniques, methods and routines as to make it accessible to people of all ages. This is compounded by the fact that as skill progresses, so too should one’s ability to nullify force with softness and skill. Traditional systems emphasize applications (Yong Fa). To do so effectively, they must study a wide spectrum of subjects related to combat. Consequently, most traditional Chinese martial arts focus upon forms, two-person forms, weapons, two-person weapon sets, body conditioning, striking training aids, internal exercises and free fighting. This is especially true for family systems such as the Lee family Flying Crane. White Crane’s founder, Fang Chi-Niang, was a petite woman who lived in violent times. Fang Chi-Niang reasoned that certain vulnerable areas of the body could not be hardened or conditioned to resist injury. Powerful strikes to the temples, eyes, throat, solar plexus, floating ribs, kidneys, groin, knees, etc., could successfully debilitate even the most determined attacker. Consequently, attacking pressure point targets with specialized hand strikes became a trademark of Fukien White Crane. 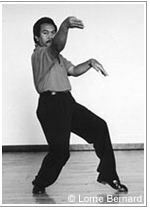 The Fung Ying Chuan (Phoenix eye fist) is the most commonly used specialized fist technique. It is named for the slightly protruding index finger which resembles the eye of the legendary Phoenix. It is most useful for pressure point attacks, since it concentrates one's entire power in a very small area, namely the second joint of the index finger. This means that power is extremely focused and that it tends to penetrate deeply. Although it is necessary to practice specific hand and finger strengthening exercises to effectively use the Phoenix eye fist, it is nevertheless considered a relatively easy technique to master. A second commonly used hand formation is Biao so, or Spear Hand. It is formed by completely straightening the fingers and thumb and keeping them held tightly against each other. It is used exclusively against the body's weakest points, such as the eyes, throat or groin. Further hand formation used in Flying Crane include: edge of hand strikes,crane, eagle, tiger, and dragon claws. Most other hand movements either mimic a crane's wings or resemble classical Southern Kung Fu systems hand techniques. A unique feature of the White Crane system is the manner in which the many empty-hand and weapon forms are designed. The forms are comparatively short, and many of them are designed to be done as fighting sets with a partner. That is to say, the various blocks, counter-strikes, and joint locks in the second half of a given form make up the correct response to the various moves of the first half. Thus, one can familiarize oneself with the movements in solitary practice, and then test one's understanding in a controlled-contact environment with a partner. This system ensures an organized approach to mastery of not only the individual movements, but also the fighting theory and real-world application of the form. Besides forms and two-person sets, students also condition their bodies and practice striking various training equipment. Several sensitivity or listening drills are also emphasized. For example, students often pair up and extend their arms so as to make them touch. From this position, they practice attacks and counter-attacks. Regular practice of this listening hands drill permits students to feel their opponent's intentions and act accordingly. It also provides a safe and realistic forum from which to practice the application of their techniques. Free sparring is also introduced early on and is emphasized according to the individual's wants, desires and skill level. Finally, advanced breathing exercises are taught on a one-on-one basis due to their nature. Weapons are introduced fairly early beginning with White Crane's famed Seven Star Staff (Chi Sing Guen). Along with the spear (Chiang), three-sectional staff (San jie guen), halberd or General Kwan's Broadsword (Kwan Dao), cane (Gwaijian), Horse Cutter Broadsword (Jam Ma Dao), and the tiger fork (Jing Fu Cha), there are several double weapons in Flying Crane. These include: Double iron rods (Swan jien) which are similar to Japanese sai, double broadswords (Bai Her Dao), double daggers (Bi Shou), and southern short swords (Nan Dao). Single weapons include: Single Broadsword (Dao), Straight sword (Dsien) and Fan (San Tse). There are over 80 empty hand forms in the Flying Crane style. Some are very short, others rather long. There are also a great many weapons forms. A good White Crane fighter can, amongst other things, sidestep and strike an opponent. This tactic is very effective in self-defense scenarios against a completely committed and possibly enraged adversary. It was not designed for the often tentative, forewarned and illusory nature of controlled sparring involving mutually consenting competitors. This brings us to a most important point: Authentic Chinese martial arts were created and evolved to be devastating self-defense systems. As society changes and evolves, however, many martial art systems have changed their fundamental nature and modified their training regimen. We can safely distinguish between those arts that have remained faithful to their tradition of all-or-nothing self-defense and those that have become martial sports. Both have something very special to offer to the public. There is, however, a great difference in approach. During this period, Emperor Chien Lung ordered the destruction of the Southern Shaolin temple after having been informed of revolutionary activities on its grounds. Fang Hui-Sz was one of the few fortunate ones to escape the attack. He sought out his wife and daughter and they initially settled at Pik Chui Liang. Subsequently, Fang Hui-Sz moved to Sah Liang temple near Foochow, where he spent his spare time refining his daughter's Shaolin Kung Fu. Fang Chi-Niang eventually mastered everything her father could teach her and chose to combine the crane's spirit and movements with her Shaolin Kung Fu. She taught Kung Fu at Sah Liang temple to Weng Wing-Seng, Lee Fah-Sieng, Chang The-Cheng, and Ling Te-Sun. Weng was from Lei Chow Fu, Lee was from Chow Ann district, Chang was from Wing Chun district, and Ling was from Foochow. Weng and Lee taught many students at Kao Pei Cliff and set up a school there. Chang (nicknamed Nine Dots monk) settled at the White Crane temple and taught martial arts. Ling's descendants moved to Taiwan. Lee passed his skills to his son Lee Mah-Saw. Lee Mah-Saw continued to set up schools and taught in Chow Ann district. Fang Chi-Niang's teachings gave birth to different interpretations and four principal styles were developed: Flying Crane (Fei He), Eating Crane (Shi He) Screaming Crane (Ming He) and Sleeping Crane (Jan He or Su He). Later on, variations and combinations with other systems occurred which led to the creation of even more types of Fukienese White Crane. At this point, it may be useful to debate whether the Fukienese White Crane arts are truly Shaolin systems or whether they represent a separate school. Since they were created outside the temple, many older generation White Crane masters do not consider their art to be a Shaolin art. This belief is compounded by the fact that White Crane focuses heavily upon soft power in the advanced stages. On the other hand, the founder did study from her father who was an accomplished Southern Shaolin practitioner. Consequently, it is difficult to resolve the debate as it is largely a question of perspective. Perhaps it is best to acknowledge the root of the art while simultaneously recognizing the founder's unique contributions. Historically, with the end of feudal social systems and the widespread use of firearms, advanced methods of combat are no longer an every day necessity. This fact of life, combined with the traditionally secretive nature of kung fu instruction, is contributing to the loss of an irreplaceable part of China's cultural heritage. Many of the hundreds of different styles of kung fu are in danger of being lost or diluted to the point of extinction. 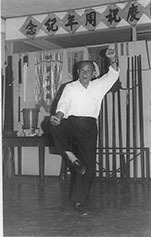 For practitioners of Fukien-style White Crane Kung Fu, the life of Grandmaster Lee Kiang-Ke (1903-1992) represents both a link to the past and window toward the future. To properly understand the reverence a martial artist has for his or her Grandmaster, it is necessary to view the martial art in its proper historical and cultural context. One important difference between the martial arts and other forms of physical activity is that martial arts can be practiced and enjoyed for a lifetime, and progress can be made at virtually any age. As such, many older masters are considered living treasures, due to the decades of accumulated knowledge, experience, and teaching expertise that they possess. Today, fewer and fewer people are willing to devote their lives to the study and teaching of martial arts as was done in the past. Because of this unfortunate reality, priceless martial knowledge often disappears forever upon the death of an elderly Grandmaster. This is especially true in the many styles of Chinese martial arts, where kung fu Shifus were secretive about their personal fighting art, and unwilling to disseminate it indiscriminately. Fukien Shaolin White Crane Kung Fu is continuing to thrive, thanks to the enlightened thinking of one of its foremost proponents. Third-generation Grand-Master Lee Kiang-Ke was the single most influential person responsible for the preservation and dissemination of the flying crane system of Fukien White Crane. His choice to open to the public what had previously been a closed-door system ensured the survival of a most complete and devastating Chinese martial art system. Grandmaster Lee Kiang-Ke (Lee Kiang-Kay) started to learn Kung Fu from his father at the age of seven. After 10 years of arduous training, his father sent him away to live at a temple (Bai He An) where he furthered his martial knowledge under the instruction of a temple monk known as "Nine-dots Monk." This temple specialized in the instruction of Fang Chi-Niang's White Crane techniques. After four years of intensive study, the young master returned home to assist his father in teaching White Crane and in practicing herbal medicine. In time, he became the chief instructor and medical practitioner in his community. Later on, the Kuomintang (Chinese Nationalist government) invited him to join the 49th Army Division as a medic. He ended up also teaching the soldiers the long handled broadsword (Da dao). When his time of service was completed, he returned home and continued teaching martial arts and practicing medicine. Thereafter, Lee Kiang-Ke moved to Singapore where he stayed for six years. In an effort to escape the Japanese invasion forces, he then moved to Kuching, East Malaysia. Unfortunately, the Japanese invaded Malaysia soon after. Following the war, fellow martial artists invited him to open a club. He did so and named it the "Martial Heroes Association" (Woo Ing Tong)3. It prospered for many years. During this period, Malaysian society was quite rough-and-tumble. Polite tests of skill were fairly common. Less friendly challenges and outright life and death self-defense situations also occurred. Master Lee was famous amongst his peers for never losing a challenge.4 In 1963, he moved to the city of Sibu (also in the East Malaysian state of Sarawak). Eventually, he directed several schools in local communities including Kuching, Sibu, Sarikei, and Bintulu. In 1967, the first South East Asian Kung Fu Tournament was held in Singapore. Lee Kiang-Ke's Kung Fu brother, Lee Wen-Hung, came from China and competed. Lee Wen-Hung had studied with Lee Kiang-Ke under Lee Mah-Saw. Despite his somewhat advanced age, he won first place in combat. He then he settled in Singapore. In 1973, a White Crane student representing Sarawak (East Malaysia) went to compete in the third South East Asian Kung Fu Tournament where he won second place in combat. One of the foremost proponents of the White Crane system in North America is Shifu Lorne Bernard, based in Montreal Shifu Lorne is the official north-American representative of Grand-master Lee Joo-Chian. He began his studies with a student of Grandmaster Lee, Shifu Augustine Ngu, who immigrated to Canada in 1977. Later he was able to continue his studies under the direct tutelage of the heir to the system Master Lee Joo-Chian. Shifu Bernard travels to Malaysia on a regular basis to learn from the various White Crane masters both in and out of the Lee family. He has also arranged for the system's present leader, Shifu Lee Joo Chian, to travel to Canada and teach for an extended period of time on several occasions. Access to such highly skilled practitioners permitted Shifu Bernard to gain a deep understanding of the theories and finer points within the art. John Jackson became Shifu Bernard's student in 1999. Since then he has traveled to Montreal, Canada several times per year to continue his training. A good teacher understands that the vitality of a teaching institution can be gauged by the quality of its students. As such, a skilled martial arts instructor takes pride in helping students achieve new heights of proficiency. In order to acquire real proficiency in any art form, It is essential to fully master that art’s basics. For this reason, we let people progress at different paces according to their own abilities. Furthermore,our teaching is one on one and “very hands on”as we feel it is the best way to learn this system. At the White Crane Kung Fu Academies we put the emphasis on the apprenticeship of a traditional Chinese martial art done so in a serious yet pleasant atmosphere. To learn more about our authentic traditional Chinese martial arts program, please schedule an appointment to visit the Academy. 1 This account was given to Shifu Lorne Bernard by Grandmaster Lee Kiang-Ke during his first trip to the Orient in 1989. There are several accounts of the origins of Fukien White Crane Kung Fu. Fortunately, they are all quite similar in that they generally refer to the incident with the crane, and the fact that Fang Chi-Niang eventually became extremely skilled in martial arts. 2 It is noteworthy that in Grand-Master Lee's account, the crane was interpreted as being the personification of a god descended from the heavens and determined to teach Fang Chi-Niang martial arts. 3 It is noteworthy that the name "Wu Ing Tong" was actually the original name of one of the Lee family's Herbal stores in Chow An, Fukien province. 4 His prowess was generally explained by his incredible speed of execution. 5 This is his subtle way of criticizing those who waste countless hours fixed at the television screen.